A compact oven that also gives you the convenience of hot plates along with a host of other fabulous features. 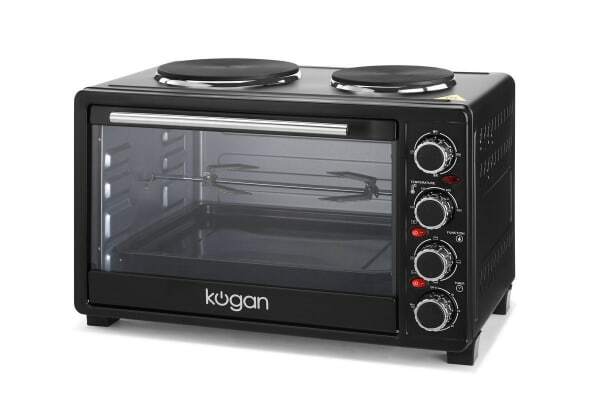 The Kogan 33L Electric Oven with Hotplates is perfect for you if you’re looking for one space-saving appliance that takes care of multiple cooking tasks. 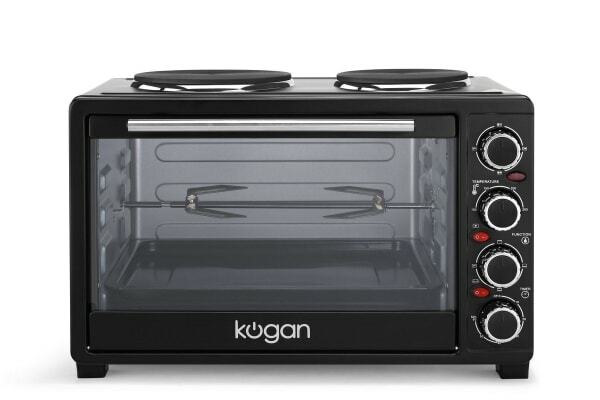 But don’t be fooled by its little size, this oven is equipped with all the features of a traditional oven and more! Besides, its capacity of 33L is quite sufficient for cooking up roasts, pizzas, or casseroles for your family. Featuring two powerful hot plates on the top of the unit, this multifunctional oven steps in to help if you don’t have a stove in our kitchen. Use the hot plates to fry, boil, poach, steam and more! 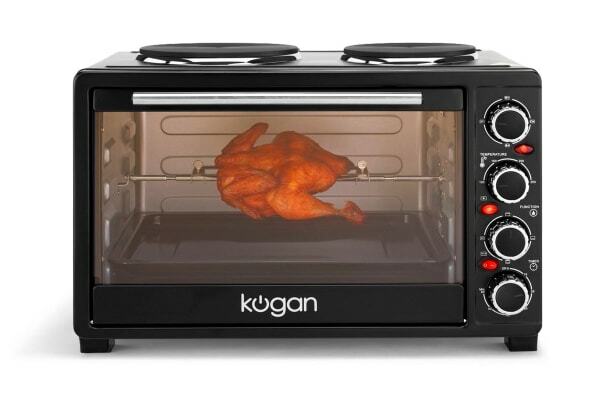 The rotisserie function lets you cook your meats to juicy perfection with the slow circulation of the hot air in the oven. Your guests will surely be impressed when you treat them to succulent chicken and lamb roasts and even gyros! Not only does the rotisserie let you cook healthier meals with its slow rotation that allows for oil to drip off, it adds more flavour to your food too. Boasting of a stylish modern black housing and premium materials in its construction, this oven upgrades the look of any kitchen that it is placed in. All the fixtures like the stainless steel handle, stainless steel heating element and enamel coated bake pan are made for the long run giving this oven a long life that will keep you churning out tasty meals for years to come. Note: The oven and hot plate can not be used simultaneously. When using the oven, do not use the hot plates; when using the hot plates, do not use the oven. 1500W power for serious cooking. Rotary function for even cooking on all sides. used the product. great size easy to operate. all went to plan for delivery of product.